The cold was as harsh as an in "late history," the coal shortage still grips the country. Joliet, Illinois is cut off, as trains are unable to move. The death of two American aviators isreported as far as the locational restrictions allow. Additionally, Captain William E. Harwood from Joliet and Private Powell from Alabama are reported to have expired from pneumonia. 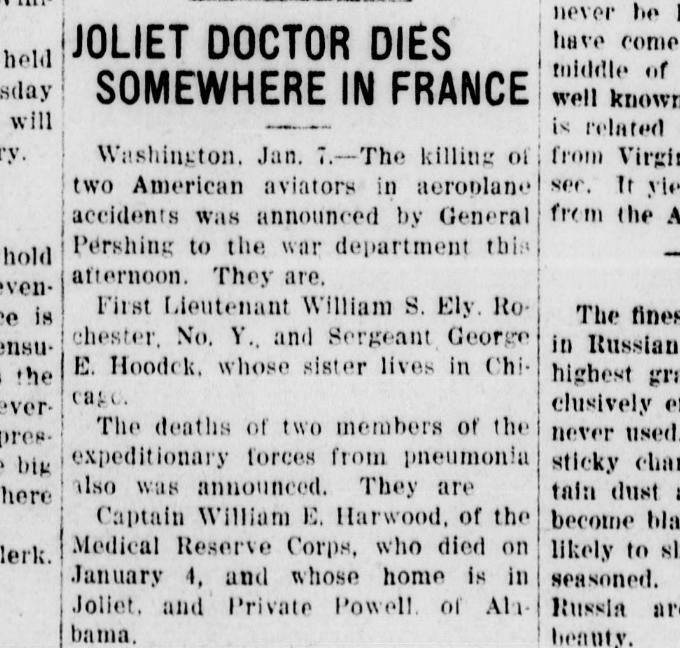 Source: "Joliet Doctor Dies Somewhere in France," Free trader-journal, Ottawa, Illinois, January 7, 1918. Page 3, Column 3.